Goddess Durga is the embodiment of the divine force of the Almighty. The word Durga, in Sanskrit means "the invincible". Durga Devi represents power, strength, morality and protection. Maa Durga is the destroyer of sin and protector of morality. Goddess Durga is also known as Shakti (Power). Durga came into being, when Maha lakshmi, Maha Saraswati and Maha Kali assimilated their powers. So, Durga is the ultimate power. 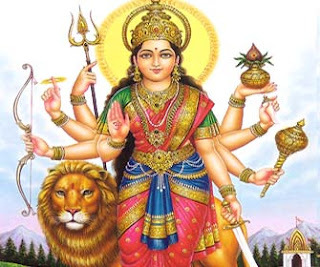 Durga is the mother, as well as the slayer of evils at the same time. Goddess Durga is known by 108 different names. It is believed that Maa Durga gets happy if, these names are spoken with a dedicated heart. So, recite these names of Durga and make her happy.